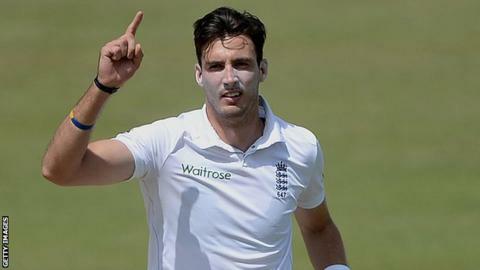 Steven Finn has been brought into England's Test squad in South Africa after recovering from a foot injury. The 26-year-old Middlesex fast bowler missed the series against Pakistan in October and November because of a bone stress injury. Finn is not expected to feature in the first Test in Durban on Boxing Day. "I've been really pleased with the way things have gone with the Lions," he said. "I've bowled my overs and my foot has come through fine. I'm excited by the prospect of linking up with the team out in South Africa." England play the first of two warm-up matches on Tuesday against a South Africa Invitational XI, starting at 08:30 GMT.